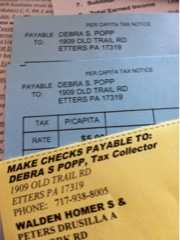 We receive bills from our local government on a regular basis. And it makes me wonder about how our money is spent by even the government entity that is right here. Several times a year, Homer and I each get an envelope with a bill for $5. If we pay the bill prior to the due date, it is $4.90. Each. 4 times each year we get a bill mailed to us for our trash removal. About $53 each time. Then comes a real estate tax once a year. Then there is a school tax, which is due in August. Or August, September and October if preferred. I'm no efficiency expert: but we cannot pay these bills online. As far as I can tell we can't receive them on line. So our money is going to paying for envelopes being stuffed, sealed, stamped. And then opened, data entered manually into some tabulation/tracking system, check deposited. Across York County there are a total of 72 school districts. Each has their own system. For food, teaching materials, cleaning gear, sports equipment, musical gear, technology. There is a video on YouTube featuring Bill Gates, Andrew Zuckerberg and Will I Am. Many others too, speaking of the shortage of people who know how to write code that many companies outsource code to other countries because our kids are not "taught". My father died in the early 1970's. in the papers that the Smithsonian has in his files are letters of recognition from S. Dillion Ripley, who ran the entire system. Recognizing my father for...writing programs that changed system there at the Smithsonian. I've met young men and women who have attended exclusive, expensive schools for high school and/or college. Who have looked me in the eye and said how they wished they had gone to school where they were taught to code. There are kids books written on how to write HTML. There are employers crying out for people to employ some basic Java or C or a multiple of other languages. While I get it, that my local school system is unlikely to have, in its teeny tiny world, a teacher who can conduct training in programming or code writing, they should. I get it that across this enormous state their are people in thousands of offices, stuffing envelopes that enclose invoices for virtual pennies, and then must open and process every check that pays those invoices. I get it that high school kids graduate with no job prospects that they can see. I get it that computers are expensive (they aren't really anymore) and finding coders is impossible. Actually, there are a few. Everywhere. There are solutions. It sure would be nice to see a larger vision, a recognition of skill sets that are needed, applications that would save us all time and money. And would save me hand writing checks and mailing or hand carrying $9.80 to my township office. And the trash bill. And the real estate tax. And the 3 payments of school tax. Maybe another jurisdiction in PA has upgraded their systems and we could duplicate what they have done? Maybe a local bank or credit union could work with our township to make this happen? It's 2013 after all, lets use our money wisely. If coding were available as a class to more people at younger ages the kids would not be afraid of it and would demand changes. And new work would be created, work that increases efficiencies.